We welcome Wave Capital to our Partner Fund portfolio. 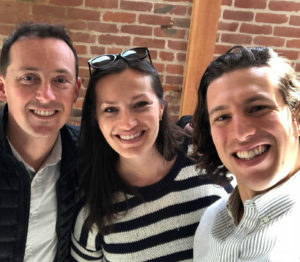 Based in San Francisco, Wave was launched last year by Sara Adler, Riley Newman, and David Rosenthal. Wave specializes in companies creating marketplaces and invests in companies at their earliest stages, as they build their teams, find product market fit, and work towards their Series A.
Leveraging their Bay Area roots and deep Silicon Valley networks, the Wave team is targeting top talent spinning out of major tech companies like Airbnb, where Riley built and led the Data Science team and Sara launched the Corporate Development program. They will also target marketplace startups in Seattle, where David spent over six years investing in early stage companies at Madrona Venture Group. Wave’s focus on marketplaces was immediately intriguing to us, given our own marketplace investment theme. We initially met David through our co-investment with Madrona in the dog care marketplace, Rover, where David worked closely with the founding team. Throughout his venture career, David has won the hearts of many founders, who think of him more as a co-founder than an investor — someone who not only shares their vision for the company but rolls up his sleeves and works side by side with them in the startup trenches. Riley brings a data-driven, operator perspective as one of the first ten employees at Airbnb, growing its Data Science program from a team of one to over one hundred. Sara rounds out the team with extensive Corporate Development experience at AirbnB, Dropbox, and Facebook, bringing deep knowledge of long-term growth strategy and what it takes to get to a successful exit. We’re excited about Wave’s network and ability to help marketplace companies at their earliest stages. We think of Wave as a window into the next generation of great founders focused on building highly scalable marketplaces across many industries. We’re thrilled to partner with Wave as they build their firm and first portfolio and look forward to co-investment opportunities as their companies grow. You can learn more about Wave and their new fund here and here.